In the text Creative Evolution Henri Bergson discusses various perspectives related to the idea of duration. Bergson’s understanding of duration is based on an assumption that the world has only a past, an accumulated history which continuously evolves and expands. This idea is at odds with many of our common perceptions of time as a linear continuum. For Bergson time is a thing, an object, a life-form; it grows, evolves and foremost endures. So too does time become a thing in the works of Levin Haegele and Daniel Olson, the artist’s featured in Smokescreens at TRUCK Gallery. For both of these artists time has a presence, a resonance that propels mysterious and profoundly simple investigations into material, site, perception and thought. 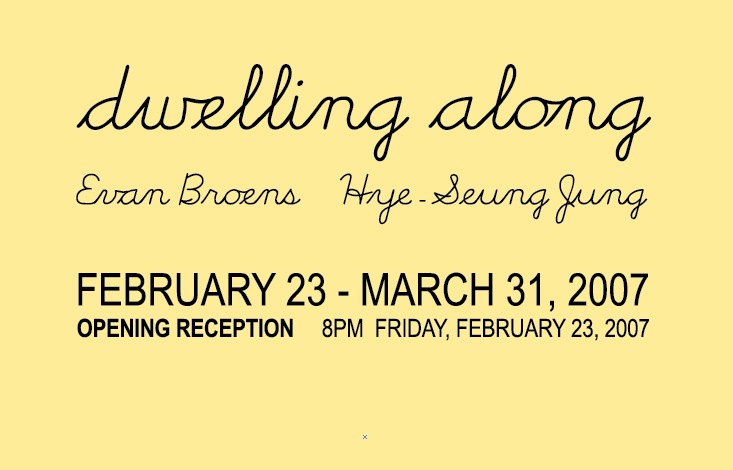 The title of the exhibition implies a ruse, a subtle subterfuge intended to misdirect. In Daniel Olson’s two single-channel works Illumination and Smoky Haze the feeling of a mysterious agenda is tangible. In both works there is a Noir, filmic quality suggesting fragmented narrative arcs. In Smoky Haze Olson smokes a cigarette off camera, exhaling puffs into the frame while a wind-like sound track plays. The audio is actually a slowed down recording of the artist whistling a series of random notes. In the second piece, Illumination Olson lights a matchbook in a dark space, allows it to burn, and then blows it out. What is common in both of these videos is a sense of intuitive cinematic alchemy where fragments and props become more than just passing details. Rather, the objects and materials are imbued with a sense of secret importance through the artist’s mediation. Ultimately, Olson encourages us to spend time unraveling his little mysteries. Only after careful consideration do we find that the pieces have more to do with the construction of meaning itself than any specific story or idea. Levin Haegele’s work similarly investigates the various tensions and levels of suspended disbelief inherent to the ephemeral, but whereas Olson’s work is somewhat secretive and seductive, Haegele’s two videos utilize the openly ambiguous space between recognition and illusion. 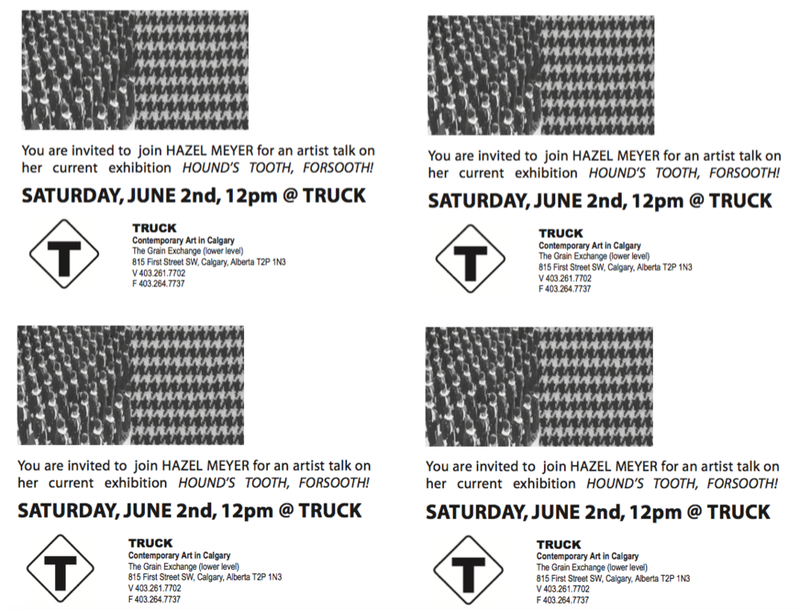 In Fuse Piece (Calgary) Haegele uses Visco (a fireworks wick) to create a looped video around the area of Truck Gallery. This fuse constantly burns, but never reaches its destination, provoking a feeling of anticipation that is ultimately unfulfilled. His second work Cigarette Piece films the red embers of a cigarette as they fall through a dark space onto the floor. The effect is reminiscent of a fireworks display, albeit without the pomp and festivity. Alternatively, we are induced into a more contemplative reading that defers from violent spectacle. Like Olson, Haegele suggests that within everyday materials resides a complexity that can be revealed through juxtaposition, re-contextualization and protracted consideration. Haegele’s two videos smack of a humble engagement with the world that is both mesmerizing and sensitive, coaxing us to further evaluate common places and objects. four videos establish an environment with an overall emphasis on brevity, understatement and contemplation. Consequently, the videos taken as a whole or in part are indicators of a larger set of concerns that feed and augment each other. Olson and Haegele’s videos become fuel for each other’s fire, igniting new trajectories while extinguishing old ones, all the while guiding a subtle investigation of the fleeting and enduring aspects of life. i Creative Evolution, Henri Bergson, Dover Publications Inc., Mineola, New York, USA. 1998. P. 4. Scott Rogers is a visual artist and writer based in Calgary. As a youth he was a part-time arsonist. “We announce the birth of a conceptual country: Newtopia. Citizenship of the country can be obtained by declaration of your awareness of Newtopia. Newtopia has no land, no boundaries, no passports - only people. Newtopia has no laws other than cosmic. All people of Newtopia are ambassadors of the country. As two ambassadors of Newtopia, we ask for diplomatic immunity and recognition in the United Nations for our country and its people”. From the perpetual motion machine to Habitats in cyberspace, nearly five centuries of utopian paradigms have played an active role in the development of Western thought, exemplifying the belief in providing a model of social and economic perfection. “Michel Foucault refers to utopia and heterotopia as peculiar spaces that at once relates and contradicts with other sites, and also, as "Other spaces" that deviate from the everyday”. It is in this spirit that each body of work presented in Salvaging Utopia opens a dialogue on the fluidity of intersections between the private, the public, the restricted and the imaginary as representations of contemporary utopias. In Lisa Benschop’s, installation, ...yore, the predominant green avocado color, the scale and the carefully placed composition all work to aesthetically link the objects. Such an axiomatic relation offers the viewer a space for reflection and/or contemplation on such issues as gender roles and consumption in both post and cold war eras. In Untitled (signs) (2006), the three framed, ornamented tapestries with the handwritten green texts: “please do not touch the display”, “seriously” and “please stay out” seem to destabilize any fixed reading of the hierarchic nature of the institutionalization of art object into “high and low art”. By playing with such conventions Benschop is carefully constructing an ambivalent relation to the utopian institution of Art. Just add Water by Sarah Jane Gorlitz and Wojciech Olejnik explores the hybrid nature of constructing Reality and Truth. Like illusionists, they take us on a poetic visual and sonic voyage into a ‘non-space’, symbolically represented by an underground subway station. The flickering lights of the slowly flooding space confront the spectator with erratic stop-motion images. “With each passing frame the medium of stop-motion brings attention to its own being, to its own form, away from the measure of time, away from its jurisdiction”. Inspired by cyberspace and the pragmatic domestic architecture of the seventies, Stéphane Gilot’s installations address the notions of perception and reality. More precisely, they explore the ways in which we live vicariously through our constructed illusions, “therefore [becoming] a hybrid, paradoxical space where the lack of privacy intermingles with freedom, detention and utopia”. By placing the spectator in front of a series of poetic contradictions, each body of work engages the viewer toward a self-introspection on the complexities between perceptions and the communication of one’s own values and desires. Jean-René Leblanc Ph.D. is an artist and professor of Digital Arts at the University of Calgary. 2 Hasegawa, Y. (2003) Heterotopias (Other Spaces), (page consulted on June 15, 2007) http://www.jpf.go.jp/venezia-biennale/art/e/50/02.html 3 Gorlitz, S-J., Olejnik, W. (2007) Just add water. 4 Duguet, A-M. (2006) World 2, Berlin Transmediale. 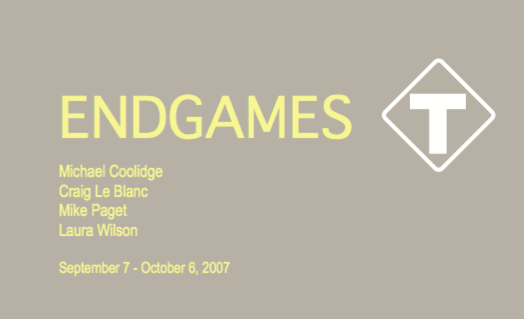 5 Gilot, S. (2001-2003) Escape Plans number 3, Montréal, the Pavillion for Sensorial Reorganisation. THE WHO lyrics - "Join Together"
C'mon C'mon is about falling prey to the outrageous signs of desire and expectation that music of any genre constructs and then delivers at high volume. This twisted idea that “there will never be another one as desirable as you” is the edge on which most rock gods balance, and the place from which their total package is designed, assembled, and shipped out to the hungry. Negotiating nostalgia in the wake of recent history seems a tricky territory. We can long for “the good old days” prior to obesity epidemics, celebrity derelicts, and looming ecological ruin, but never without the tainted understanding that we are intentionally fabricating our idyllic histories. We know that our past was nothing more than symptomatic groundwork for our imperfect present, and we have been conditioned through apathy, nihilism, and disillusionment to know that our nostalgia is convoluted and likely based in our fear of the future, yet we dwell regardless. Like a child wildly imagining the future, we wildly imagine the past, and hopelessly reaching for one crystallized moment of good, we create our beautiful memories. Sprouting out of a postmodern archetype and into a new millennia of extreme and disparaging self-awareness, our distilled sentiments of nostalgia can only be received by first endowing them with precise measures of a contemporary force-field, irony. Irony, however, seems to have evolved into an idiom apart from the proverbial shoe-less shoe salesman that grade school taught us. Irony has somehow seeped into our general consciousness, situating itself intoour everyday responses, causing us to see droll contradictions and quaint paradoxes at almost every turn. Being connoisseurs in all things ironic, we are keenly able to recognize its victims, and have adapted its uses, protecting our own sincerities from becoming nothing more than fodder for droves of savage cynics (a cannibalistic group to which we belong and whose subtleties we know well). This isn’t to say we shrug our sentiments before anyone else can — exposing our stripped and shivering affections and laughing at their inadequacies to prove we are, rest assuredly, in the know (although this is sometimes the case, but is a practice unappreciated by the true savages). More likely, we are simply so well versed in the nuances of irony that even a knowing wink has become too obvious. A picket fence, familiar only because of television and storybooks, precisely “broken” to reveal an ephemeral world of toy airplanes and golden wheat (Broens’ Fencing Planes); a web of strings indicating a place long forgotten yet precious to the artist (Jung’s Chebudong Project); such productions softly weave through diminutive ironies, at once sincerely representing and elusively exploiting the delicacies of nostalgia. -Sarah Adams is an artist and visual arts writer based in Calgary, AB.